Johnny Cash didn’t always make great albums. Sometimes, especially into the 1970s, he was more of a live performer and going to the studio to record was an afterthought. As a result there was frequently a great song or two and a bunch of mediocre filler. In the 1960s he did a number of concept albums. These would often get off on the wrong foot, like Blood, Sweat & Tears opening with an overly-long “The Legend of John Henry’s Hammer.” Orange Blossom Special fits into his concept album era. It was Cash making overtures to the urban folk revival movement. He had already appeared at the Newport Folk Festival in July of 1964, and later that year he was in the studio recording this album. It’s an odd thing really. There is an offhand quality to this, and Cash hardly seems to be pushing himself. But it’s still a fun one. 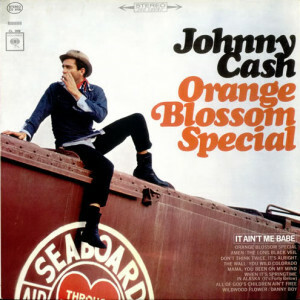 The opening “Orange Blossom Special” is a railroad song — Cash loved railroad songs. It’s a weaker, almost forced performance. But the album picks up. Cash considered himself a collector of songs. So it’s no wonder he came to Bob Dylan pretty early on. While recording At San Quentin he even announced to the audience that Dylan was a great songwriter. There are three Dylan songs here. “It Ain’t Me Babe” is the pick of the bunch. It may just be the definitive reading. “When It’s Springtime in Alaska (It’s Forty Below),” a duet with June Carter but not a Dylan song, is the other classic here. In all, the song selection is superb. It’s eclectic enough to include The Carter Family‘s standard “Wildwood Flower,” the Irish folk tune “Danny Boy,” and the rousing religious number “Amen.” There may be better performances of some of the songs like “Long Black Veil” and “The Wall” on At Folsom Prison, but the quirky performances here keep things fresh so that even listing to this back to back with other versions nothing would drag. It may take a few listens to come around to this one. But it is such a pleasant, unassuming little album that touches on so many classic themes of love, god, murder and liberty that run through Cash’s entire body of work that fans may find themselves coming back to this one more than most.